A monster of a man, resembles an NFL lineman in both size and strength. Though he might appear to be menacing, he is actually quite a jolly man. He tries to keep this image up with his greying beard. He has a large nose and puffy eye brows, also he has a little bit of a gut. Extremely Jolly, but only when he is off duty. Otherwise he is a professional enlisted man, doing everything asked of him without question. He definately knows his place aboard the ship and the senior officers respect him as one of their own even though he is an enlisted man. Does have a little bit of a temper but has learned to control it with time. Bowling, fishing, gardening, orchids, frisbee, piloting, writing, poetry. Born in the Arabian Penisula, Omar started out his life just like any other boy. He went to school, learned some languages, played with his friends etc. When he got a bit older and graduated from school, he looked around for a career that suited him. Starfleet seemed a ideal choice but he had met the love of his life in his first week in San Fransisco, Jessica Smith. Instead of enrolling as an Officer, he decided to enlist instead so that he could have a family. It worked out, he joined Starfleet in 2367 and married a year later. His training lasted two years and before long Omar and his wife were both travelling the stars together aboard various starships. In 2372, he had a son, Robert, and he couldn't be more proud. In 2378, Omar was transferred off the USS Illustrious and his wife decided that she would remain with their son on earth. Both parents, ever loving, knew that their son needed stability, so they settled in San Jose. 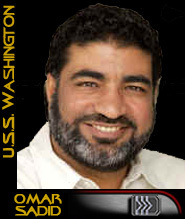 Omar continued his career in Starfleet but still makes constant visits to earth to be with his wife and son.